Dr Mashiur Rahman, Economic Adviser to the Prime Minister, is seen at the launching programme of fourth generation bank ‘Padma Bank’ at a hotel in the capital on Saturday. Economic Adviser to the Prime Minister Dr Mashiur Rahman on Saturday underscored the need for ensuring good governance in the country’s banking operation utilising the government’s policy supports. “The government helps the banks manage capital shortfall from the national budget,” said the Prime Minister’s Economic Advisor while addressing the launching programme of fourth generation bank – Padma Bank. The authorities have recently renamed scam-hit Farmers Bank as Padma Bank. Financial Institutions Division Secretary Asadul Islam was the chief guest while Padma Bank’s Chairman Chowdhury Nafeez Sarafat presided over the meeting at Westin Dhaka. Bank’s Managing Director Ehsan Khasru made the welcome address on the occasion. Besides, three top executives of four state run banks – Sonali Bank Managing Director Obayed Ullah Al Masud j, Janata Bank Chief Executive Abdus Salam Azad, Agrani Bank Managing Director Mohammad Shams-Ul Islam and Rupali Bank Chief Executive Ataur Rahman Prodhan – attended the the inaugural programme of the bank. 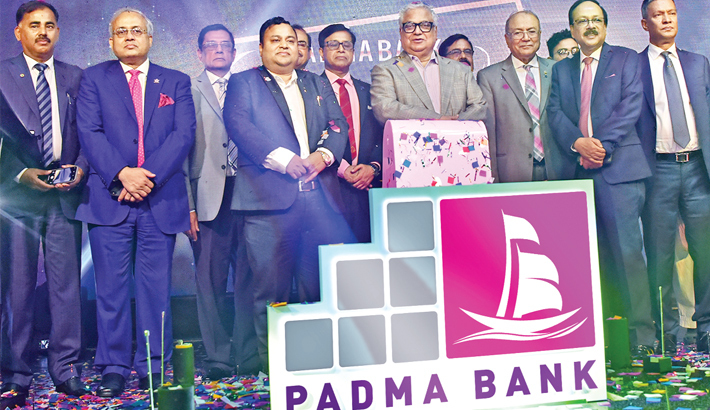 Financial Institutions Division Secretary Asadul Islam expressed hoped that Padma Bank will contribute to the country’s economy like the mighty river, after which it was named, that ensures water flow for the land. Rupali Bank Chief Executive Ataur Rahman Prodhan highlighted the contributions of public sector support for re-construction of the scam-hit bank. Padma Bank Chief Executive Ehsan Khasru said the bank has been maintaining operation through 57 branches across the country. Earlier on end of January, the scam-hit Farmers Bank was renamed through a notification of Bangladesh Bank. And four state-run banks and Investment Corporation Bangladesh (ICB) took major shares (68 percent) of the much-talked-about bank in the country.